Most make the mistake of noticing only Arcee's gender, but these first impressions are quickly expanded upon. 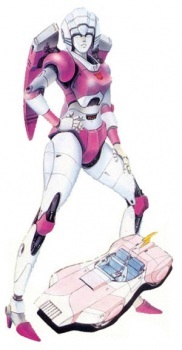 Arcee is a merciless and deadly warrior who's an expert in hand-to-hand combat and one of the best sharpshooters on record. The reason for her ferocity is how much she cares for her fellow Autobots (Cybertrons in Japanese version) and especially the humans they protect. She knows how fragile her organic companions are, and she's equally aware of the evils the Decepticons (Destrons in Japanese version) are capable of. Peers such as Hot Rod (Hot Rodimus in Japanese version) and Springer (Sprang in Japanese version) may be more durable than the humans, but she no less fights to defend them as well. They get in plenty of trouble, so someone has to be the level-headed one. If concern for her friends is her strength, it's regrettably also her weakness. She may be quick, but she's not very strong.